Are you ready for another school year? (For those whose school starts tomorrow.) Excited to see your friends, or annoyed as you would have much less free time and lots of studying, homework, etc? As a person who finished high school a while ago, I am saying those will be the best days of your lives, and you will miss them, I am sure, so just enjoy. 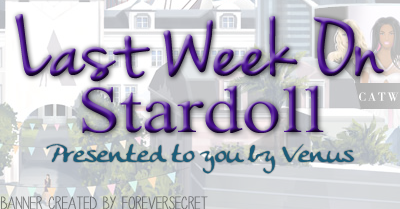 I can also guess some of you will have less free time to visit Stardoll and USD, and that's why these recaps may be useful to you.So ready or not, here I go. On Monday, we got new interior collection in Villa store. Simple, yet quite attractive items. I like how they made zebra print chairs, the placement of them. Stairs are really fab. Lots of interesting and useful stuff. Only 2 starcoin items - is Stardoll forgetting about members who got only starcoins? Other items may seem ordinary, but yet different. Overall, a great release. Callie's Picks, once again, on Wednesday. This time MSW themed. Miss Stardoll World contest is just around the corner. (Seriously, there is even a 'MSW 14' sign on Stardoll homepage. ) Quite an interesting idea for CP, bringing back collections from previous MSW inspired stores. Especially as they aren't sellable, so there is no other way of obtaining items you missed previous years. The collection consists mostly of short and long, glamorous and trendy dresses. I love the shoes too. This seem to be Callie saying to better start preparing for upcoming contest. Ands yeah, a lot of people are preparing on several different ways. And the highlight of a week, (just kidding), is a new floor of Spectacular sunglasses store. It is certain that most of them look quite fabulous. Prices are fair too. A variety of frames, patterns and shapes. But one thing bothers me - why make them go to beauty parlor? Having to visit Beauty Parlor just to change sunglasses. How about when you have saved different outfits in different rooms - I am not sure those sunnies would look good on each outfit. Yup, that's all for this week. Not much, but probably because the staff are planning and organizing MSW 14. Are you excited, and are you gonna participate? What did you think about this week? Chose your favorite, vote on the poll, and one more thing - I am really happy that I made some people smile with the last crossed over sentence. You made me smile too.